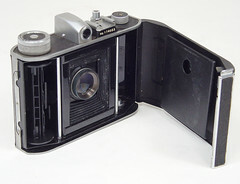 The Semi Minolta P, released in 1951, is the last folding camera made by Chiyoda (the predecessor of Minolta). 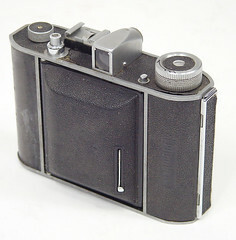 This model has less advanced features than the previous Semi Minolta III, and it has a completely different body, more rounded and with the finder and controls on the opposite side, so that the body release is actioned by the right hand. 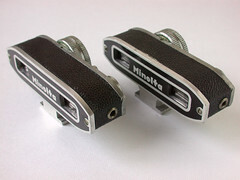 The Semi Minolta P is easily recognized by its tubular finder: it was sold at a time when the folding finders were considered old-fashioned. This finder has two indexes for parallax correction. 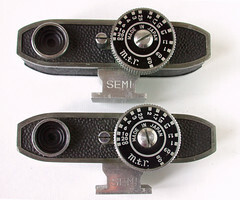 When the camera is held by the photographer to take portrait pictures, the advance knob is on the left and the back is hinged to the right. 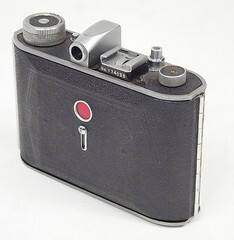 Film advance lacks the automatic stop device of the Semi Minolta III, and it is controlled by a red window at the top of the back, protected by a vertically sliding cover. 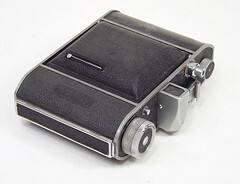 There is a thick accessory shoe at the right of the viewfinder, with the serial number engraved behind. 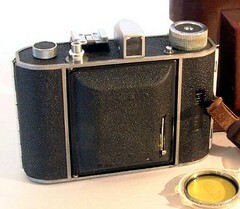 The camera is usually embossed Minolta in the front leather. It seems that some examples lack this marking, but maybe their covering is not original. 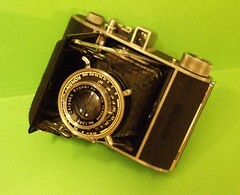 The Semi Minolta P is equipped with a Promar SII 75/3.5 three element lens, said to be made by Asahi Kōgaku. 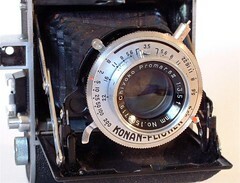 The shutter is a Konan-Flicker, giving B, 2–200 speeds and synchronized, said to be made by Chiyoda itself. A total of about 70,000 examples were produced, in two main variants. 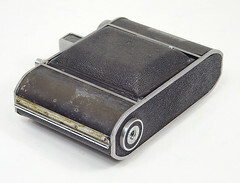 The early variant, advertised in 1951 and early 1952, has a flatter folding bed, a standing leg that folds back, and there is nothing at the right of the top plate. 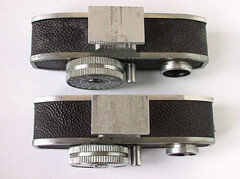 The shutter plate is black and the synch connector is the same specific type found on most IIIB and IIIC. 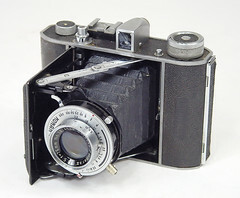 An advertisement for this model appears in the February 1951 issue of Asahi Camera and it is called Semi Minolta P (セミミノルタP型). 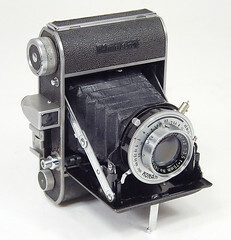 The late variant, advertised from 1952 to 1955 under the name Minolta Semi P (ミノルタ・セミP型), has a more rounded folding bed, with a standing leg retracting laterally into it. 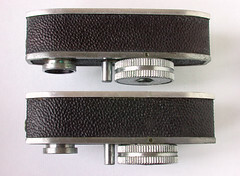 It also has a small flange added to the right of the top plate, to support the film spool, absent on the early variant, as well as an ASA bayonet synch connector. 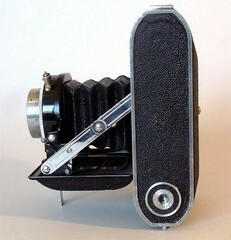 The shutter plate is black with white markings and later white with black markings. One example, probably transitional, has been observed with the new leg but without the flange and with the old type of synch connector. Another example, perhaps a modified one, has been observed with the white shutter plate and a PC synch connector. Minolta Semi P no.174053, Promar SII 75mm f/3.5 lens no.1414519. Minolta Semi P no.182341, Promar SII 75mm f/3.5 lens no.1508719. ↑ For example the one pictured in Francesch, p.84. ↑ Three elements: Supuringu kamera de ikō, p.77. 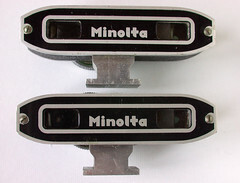 ↑ According to this page of the Manual Minolta website (archived). ↑ Supuringu kamera de ikō, p.77. ↑ Kokusan kamera no rekishi, p.368. ↑ According to Kokusan kamera no rekishi, p.368. ↑ Reproduced in Kokusan kamera no rekishi, p.194. ↑ In an online auction. ↑ 1952: Lewis, p.78. — 1954: ¥11,800 in Lewis, p.85; ¥10,950 in Kokusan kamera no rekishi, p.368. ↑ Published in Asahi Camera, reproduced in Kokusan kamera no rekishi, p.194. ↑ Advertisement published in Camera Mainichi, reproduced in Kokusan kamera no rekishi, p.195. ↑ Advertisement published in Ars Camera, reproduced in Kokusan kamera no rekishi, p.194. ↑ Second contest: see this advertisement reproduced in the Shashin-Bako website. Fifth contest: advertisement reproduced in Kokusan kamera no rekishi, p.924. Lewis, Gordon, ed. 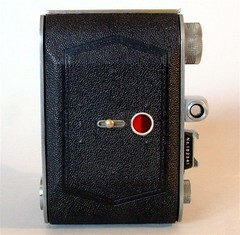 The History of the Japanese Camera. Rochester, N.Y.: George Eastman House, International Museum of Photography & Film, 1991. ISBN 0-935398-17-1 (paper), 0-935398-16-3 (hard). Pp.78 and 85. Omoide no supuringu-kamera-ten (思い出のスプリングカメラ展, Exhibition of beloved self-erecting cameras). Tokyo: JCII Camera Museum, 1992. (Exhibition catalogue, no ISBN number.) P.10. Scheibel, Anni Rita and Joseph. 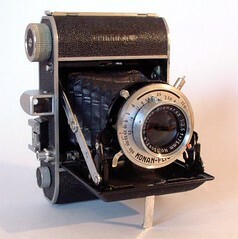 70 Jahre Minolta Kameratechnik — Von der Nifcalette bis zur Dynax 9. Stuttgart: Lindemanns Verlag, 3rd edition, 1999. ISBN 3-89506-191-3. Pp.36–7. Sugiyama, Kōichi (杉山浩一); Naoi, Hiroaki (直井浩明); Bullock, John R. The Collector's Guide to Japanese Cameras. 国産カメラ図鑑 (Kokusan kamera zukan). Tokyo: Asahi Sonorama, 1985. ISBN 4-257-03187-5. Items 1357–8. Tanimura Yoshihiko (谷村吉彦). 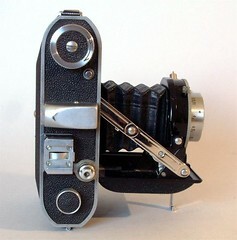 "Supuringu kamera <semi minoruta>" (スプリングカメラ<セミミノルタ>, "'Semi Minolta' self-erecting camera"). Kamera Rebyū Bessatsu: Kurashikku Kamera Senka / All about Historical Cameras, no.12, October 1988 (special issue on Minolta camera no subete [ミノルタカメラのすべて, Minolta history]), pp.19–24.